Sunday was your classic NFL case of too little, too late. And because of it, the Titans are .500 at 5-5, two games back of the Texans in the suddenly wide open AFC South after Matt Schaub went down with a foot injury. Matt Ryan threw for 316 yards and a touchdown, as the Falcons withstood the late charge from the Titans to secure a 23-17 victory. Michael Turner rushed for 100 yards and a touchdown on 21 carries for the Falcons (6-4), who were coming off a deflating 26-23 overtime loss to the New Orleans Saints. Roddy White had 147 receiving yards in the win, while Tony Gonzalez finished with five catches for 74 yards and a score. 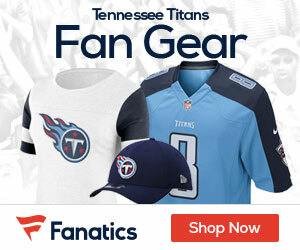 Jake Locker, the eighth overall pick in this year’s draft, replaced an injured Matt Hasselbeck late in the third quarter and threw a pair of touchdown passes for the Titans (5-5). Hasselbeck, who suffered a sprained right elbow, led the team with one 17-yard rush, while Nate Washington caught nine balls for 115 yards and a pair of scores. Locker entered the game after the Falcons’ took a 23-3 lead on Matt Bryant’s 24-yard field goal late in the third. He found Washington three plays into the drive for a 40-yard touchdown, making it a 23-10 game. 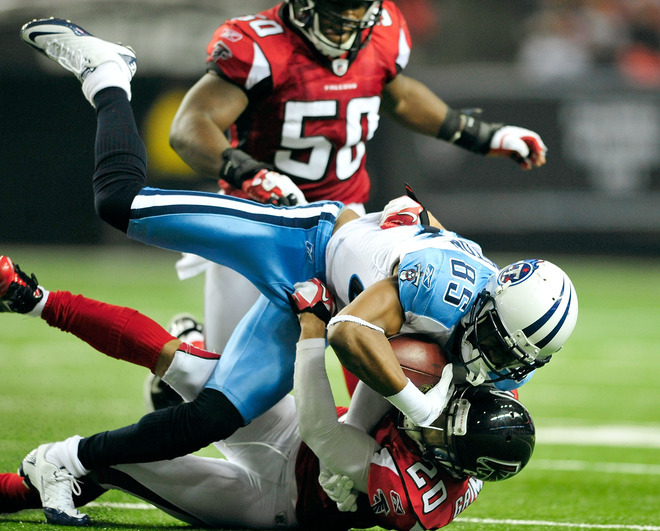 Following punts by both teams, the Falcons threatened to put the game away, moving deep into Tennessee territory. But Turner fumbled away the football at the seven-yard line with 6:36 remaining. Locker capitalized, finding Jared Cook for 22 yards on a 4th-and-17 and hitting Lavelle Hawkins for a 32-yard strike before connecting with Washington for a four-yard touchdown to make it 23-17 with 3:06 left. But the veteran Ryan ensured his rookie counterpart didn’t get the ball back, completing a 3rd-and-6 pass to Harry Douglas before taking a knee to secure the Falcons’ fourth win in their last five games. Atlanta bottled up Johnson and the Titans’ running attack from the start, allowing just 29 total rushing yards during the first half — 17 of which came on Hasselbeck’s scramble. The Falcons also intercepted Hasselbeck once — by Dunta Robinson — which resulted in Bryant’s 19 yard field goal for a 10-0 lead early in the second quarter. Gonzalez’s 17-yard touchdown reception in the first had given the Falcons the early lead. They added to that advantage with another Bryant field goal — of 33 yards — midway through the second, but the Titans finally got going late in the half. Hasselbeck engineered a 62-yard hurry-up drive, setting up Rob Bironas’ 46- yard field goal for a 13-3 game at the break. Turner, who ran for 73 first-half yards, carried his strong play into the third quarter, scoring from four yards out on the Falcons’ opening possession. The touchdown run, which made it a 20-3 contest, was set up by White’s 43- yard, over-the-shoulder grab.